I swear, I’ll stop soon. Just for fun, I set up the 1k resistor/47-50u capacitor combo again, same components as before (polypropylene vs. back-to-back electrolytics), but for a test signal, used a combination of 1kHz and 2.5 Hz sine waves, still set for 8VRMS. The distortion spectrum looked pretty much the same as before, but I thought it would be interesting to see what the sidebands looked like. I zoomed in on the 1kHz peak, changed the window to Blackman-Harris 4 (better resolution of sidebands), and changed the sampling rate to 48k to decrease bin width (again, helping resolution). The comparative data are shown here. I swear I’ll stop soon. Playing the Devil Advocate,…. And just having fun with you. 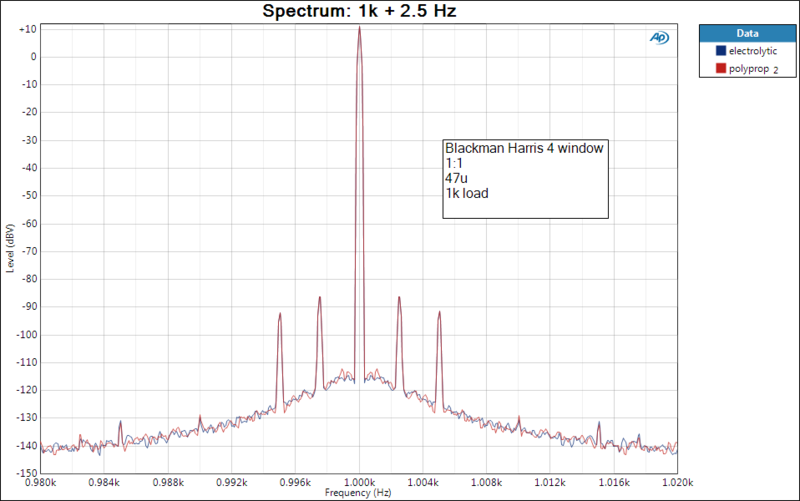 But um,… being dumb here – what is with the 1000 +/- 5Hz side bands? We used music in the listening tests, where no-one showed detection by ear of any significant differences. But of course, it’s easy to measure differences that can’t be heard, and that’s what I’m looking for here. If you’re curious, you can use DiffMaker to see how far down any differences with your choice of music might be. Thanks for the Diffmaker note. Should be an interesting tool. capacitors may in certain applications distort a signal and even emmit “sound”. It all depends on the caps construction, polarisation, frequency, and most of all the level of current trough them. None the less, bypassing electrolyts with high quality film caps may make more troubles than it would solve because of the resonant peak it migth create.